I bet everyone knows that I am into fitness for the past few months. Surprisingly, the response on my previous sharing about my fitness journey was overwhelming! To be honest, it took a lot of effort throughout the whole journey, it isn't all about eating clean and working out 24/7, but I have to keep myself motivated all the time, both mentally and physically determined. Situation changed, when I start committing into my permanent job as a graphic designer. I knew everyone of us out there, is always looking for something much easier, in achieving an ideal body figure. Not to talk about taking pills, skipping meals or doing anything harmful. HEYYYY! What about getting slim when you are sleeping, sitting, eating, shopping and working?? 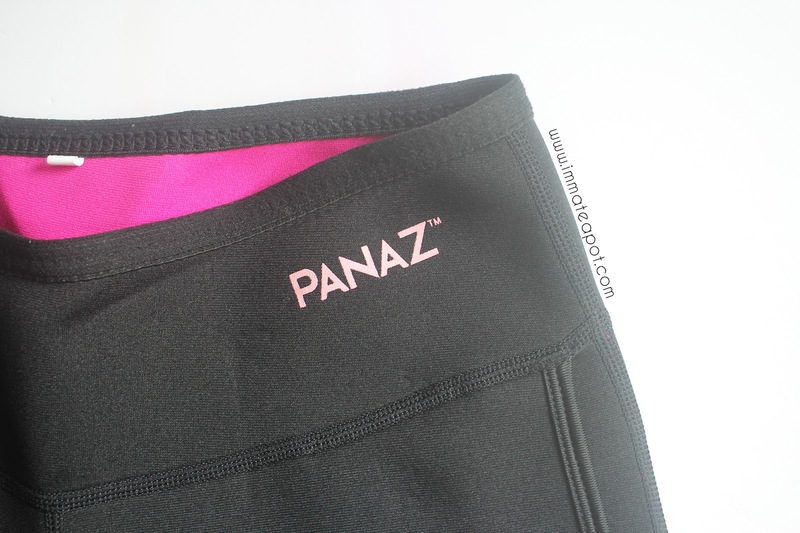 Have you guys heard about Panaz - The Slimming Pants that get you wet and sweat anytime, anywhere? Inner layer - The intelligent fabrics help absorbing sweat in order to keep our skin comfortable all the time. Middle layer - The warming material which is heat retention, helps burning fats within our body. Outer layer - The high quality fabric helps to sculpt and tone our body shape. The Panaz slimming pants is professionally and perfectly tailored, showing great attention to details as well with its slim fit design. The stretchable material convenience us in all stretching position or posing, which is just perfect for daily fitness routine. Beside, it comes with pocket design which convenient us in carrying our mobile phone, iPod, key and etc. I really love how thick and comfy the material on the skin, as a jogging pants or even pajamas. The sweat and wetness do not permeable on the pants. Indeed, it was actually sweating like hell within, yet I didn't feel any stickiness or heat! I felt my thigh is so much tighter and toned now. Beside, it is definitely a stylish pants that makes my thigh looks super slim! Never be a problem pairing up this pants with any top! Losing weight has never been this easy! Get your slimming pants now from Panaz! this is seem not bad! thanks for sharing! Stylish and slimming at the same time - a double bonus for all! I've got a pair and the material sure is very thick. Definitely sweat a lot! I have read a lot about Panaz. I definitely need this kind of pants to burn some fat from my thighs. guys can wear also ah? :D.. i wanna slimmmmmm down pun. Any before and after photos to prove its effectiveness? I have tried this before. love the sweating function, so cool! I need them so desperately. Flabby thighs need some toning. well written review for this product! worth to try! wow...the pants so nice!! !I want to buy it! !Can slim down!! Me too looking for these pants while exercising and they look comfy too. looks nice the pants, good that it comes with other benefits as well! actually the overall outfit looks well on you! Such an apt name for hot pants!